I drove the lead vehicle on the first convoy over the Ledo Road. My job was to chauffeur the convoy commander, Colonel DeWitt T. Mullet. Although General Pick received most of the glory, he actually traveled with the convoy very little. Pick was ferried in by air on several occasions to meet with the convoy in bivouac. Colonel Mullett was with us from start to finish. With rare exception, each of the 113 vehicles were towing a trailer or artillery piece. Also in the convoy was a tractor towing an engineer flatbed trailer on which was a light tank. This tank was our only protection other than each man's rifle. Thank goodness we completed the ordeal without needing either. There were also several MPs with the convoy and they were riding Harley-Davidson motorcycles. When we rolled into Kunming, every vehicle was running under its own power except two. One of the wreckers had a deuce-and-a-half (6x6 GMC) on the hook and one motorcycle was hauled in. This was probably the best completion record on all the convoys. The biggest maintenance problem we had was flat tires. It seemed like a mad rush to get to Myitkyina and then to be delayed for so long. When the word was passed to depart, we were all ready to go. Myitkyina had been devastated by the battle that took place to capture it. There was not a building left standing in the whole town. We thought we were doing real well out of Myitkyina for the road was more level. 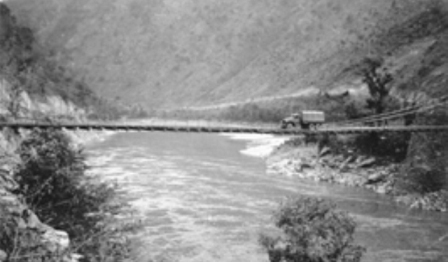 While in Namkhan, Burma, waiting for the Chinese to clear the road of Japs, we were able to be away from the convoy for short periods of time. While there, I picked up a small hand-carved stone Buddha about 14 inches tall. This Buddha is being used as a door stop in our home today. When we pulled out from Namkhan and headed for Wanting, we traveled at our fastest pace. Over much of this leg there was rifle and machine gun fire coming from both sides of the road. Thank goodness the Chinese Army held off the Japs. General Pick joined us for the big ceremony in Wanting when the convoy passed from Burma into China. Other high brass and many news correspondents were there also. On more then one occasion at the end of a trying days journey, we were treated to a big dinner and stage show by the Chinese Army. We sat at large round tables (ten or so seats) and each table was hosted by a high ranking Chinese officer. The food was delicious, especially when compared to our "C" rations, and the shows were entertaining. There was plenty of food and rice wine called "chew." We had little one-ounce glasses which the host would fill with chew. He would fill his glass, pick his glass up and say, "Gombay," at which time we were to drink the chew and turn the glass upside down on the table. The table host would hastily turn all the glasses over, fill them again and holler Gombay! This was a never-ending cycle and needless to say it did a lot of the GIs in. The convoy did not move very fast the next day. We arrived at the bottom of the Salween Gorge early one morning. It was a very nice day but the gorge and the suspension bridge we were to cross were still in the shadows of the mountain. There was to be a big picture taking session by the correspondents so we had to wait until the light was right for the photographers. Only one vehicle at a time was allowed on the bridge because of the bridge's capacity. At this point, the semi hauling the tank and the tank had to be left behind. Individually they were both too heavy to cross the bridge. This portion of the road was probably the most treacherous part of the whole trip. The road mileage from rim to rim was some 40 miles but by how the crow flies was only about ten miles. The steepness of the grades and only one vehicle at a time on the swinging bridge, all in first gear, consumed some 16 hours of driving that day. The only mishap on the trip occurred on the uphill side of the mountain. The driver of a deuce-and-a-half, towing a 105mm howitzer, cut a switchback too close and the gun fell off the road but did not come loose from the truck. Needless to say, we lost several hours recovering the gun. Upon arriving in Kunming after some 24 days on the road we bivouacked outside the city. A whole day or so was spent cleaning up our vehicles as well as ourselves for the grand entry into the city. The most disheartening part of the whole trip was to sit on the back seat of my jeep while some Chinese driver drove it into Kunming and received all the glory for the hardships I endured while driving the 1,079 miles. Chinese drivers drove all the other vehicles as well. All the drivers were flown over the Hump back to the Ledo airfield, completing one historic event.